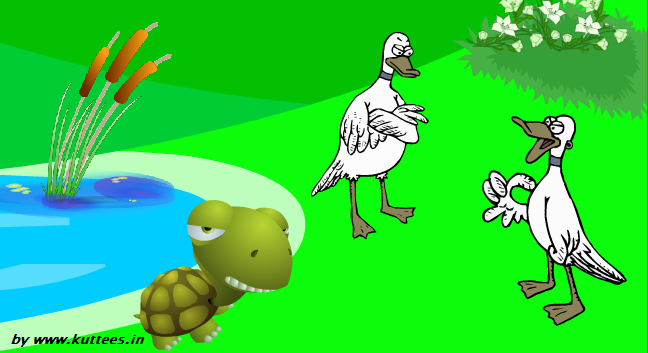 Once upon a time a tortoise lived near a pond. Two geese used to come and drink water in the pond. All of them became very close friends and lived happily for many years. Sadly, after few years a drought happened in that place and it lasted for several months. The water in the pond started to dry. One of the geese suggested about moving to a near by pond where there was plenty of water. The two geese could fly for a long distance, but they were worried because their friend tortoise will not be able to fly like them. All of them had a conversation for a while they decided upon a plan. According to the plan the tortoise would have to hold the middle of a stick piece. The two ends of that stick would be held by the two geese and they will fly to the new pond carrying their friend. Everyone were excited about the journey. 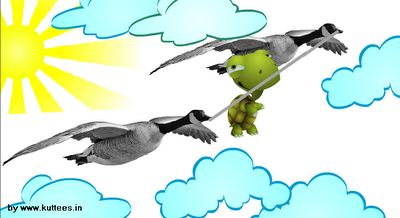 The geese warned their tortoise friend not to open his mouth at anytime during the journey for which he agreed. They started their journey and flew higher and higher. When they flew over a small village, the people in that village were surprised to see a tortoise being carried by two birds. They were laughing and talking to each other about this. This shout from the people annoyed the tortoise. He thought to himself why these people were making noise like that. Unable to control his mouth, he opened his mouth to speak. Unfortunately when he opened his mouth, he lost the hold of the stick and fell down. The poor tortoise died because of his foolishness and impatience. MORAL : Think before you act.